In early October I had the honor of designing flowers for my cousin Brodie’s wedding in Virginia. It was particularly special because I used to go to this same horse farm outside Charlottesville for entire summers from the time I was 9 years old until I was 19. It was my summer home where I learned how to ride and care for horses from my Aunt who managed two barns and nearly 100 horses on the property. I went to horse shows, mucked stalls, swam in the river (the very same one that Brodie and Jake’s ceremony was in front of), and eventually helped raise my two cousins, Brodie and Chris. I was a nanny half the day and a working barn student the other. For me, someone who was seriously horse-crazy, my summers were a dreamy mix of hard, sweaty work and endless hours of pure bliss amongst the horses and the beautiful Blue Ridge Mountains. I loved my summer family dearly and grew up a part of them as if my cousins were my younger siblings. And so it was with these bits of nostalgia that I began packing my bags to do a wedding back “home” for my “summertime sister”. Here is a picture of Brodie and Jake the day they got engaged. This was the first wedding I have done that was a plane-ride away, so I got busy preparing a suitcase of supplies from my shop. It took a bit of planning because there would be no running back to the shop for an item I had forgotten. There is no floral wholesaler in Charlottesville, so I wouldn’t be able to buy it either. So I began a packing list and eventually compiled a suitcase full of necessary items. I also packed a carry-on suitcase of eucalyptus (for her flower girls crowns), larkspur, and some eryngium thistle. Those were the only items that I would not be able to purchase or forage when I got to Virginia, so I decided to pack them in my luggage. Here I was loading my suitcase Wednesday morning before getting on the plane. My kitty, Heidi, didn’t understand why she couldn’t come too! Brodie’s goal was to use almost exclusively local flowers for her wedding. She wanted us to buy from local flower farmers that she had discovered nearby and to forage the rest of the greenery and flowers from her mother’s horse farm. I could hardly wait. I love doing flowers in new locations where I have all sorts of new greenery and flowers to use. It also brings a special touch to an event to use items that echo the natural surroundings of the venue. 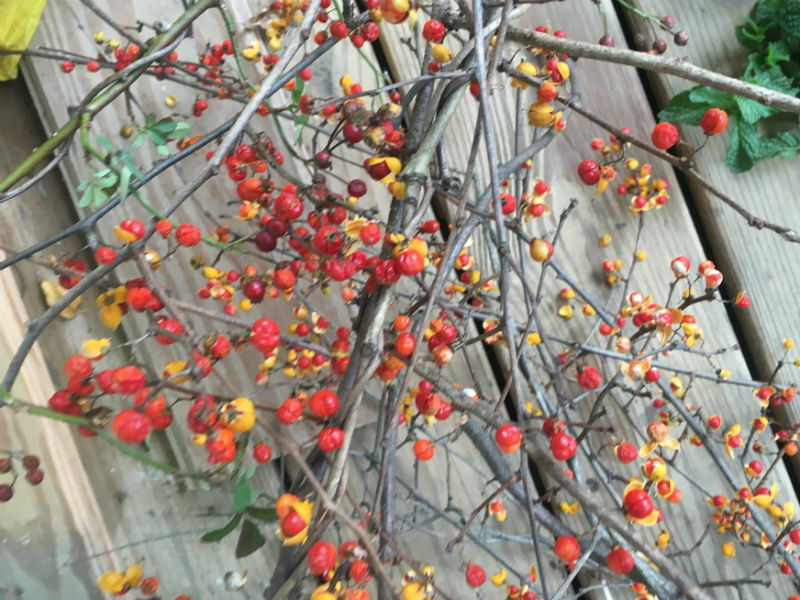 It allows for a seasonal, cohesive feel, in addition to being fresher and often more beautiful! I like to compare it to the fun of buying and cooking food from a farmer’s market compared to buying it from a grocery store. You eat just what feels right for the season, you get more unique and interesting items to choose from, you get super fresh and seriously tasty product, you get to know the farmer who grows your food, and it is always an adventure taking it all home, spilling it out on your counter, and figuring out what to make from the bounty. Buying local flowers from flower farmers is very much the same. There was slow Food, and now we have Slow Flowers. Yes, it is a real term and a movement hitting our country, just like the local foods movement did 10 years ago. I love being part of it, and it was so fun to have my cousin request these types of flowers for her wedding. It must be because she is a dietician and a true “locavore”. 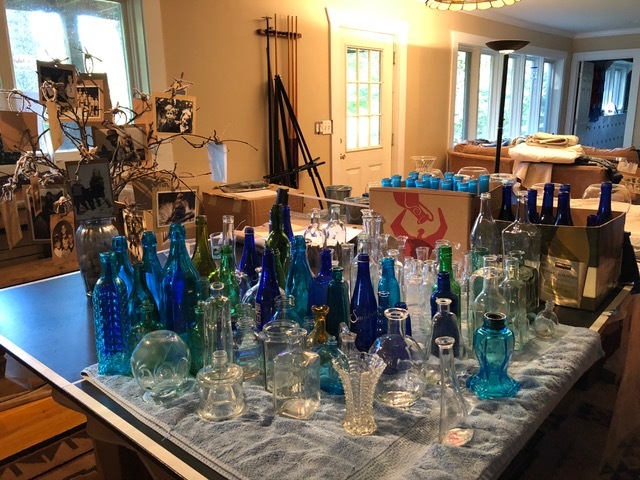 Before I got to Virginia, my cousin and I had made various orders with different flower farmers in their area and basically just gave them a color scheme and left the rest to them. It would be interesting (and admittedly a little daunting) to create something beautiful out of whatever they gave us. With all the preparations in place, the kids and I got on the plane (as my husband was harvesting beans at that moment), and we headed to Virginia. We arrived at Millington Stables and pulled into my Aunt’s house. We found a basement full of folding tables waiting for us, along with stacks of buckets for our early morning foraging session to come. My Aunt Liz and Brodie did a great job at preparing a floral design workspace for us on a concrete floor so we could make a mess without worrying; I couldn’t have been happier. We made plans for the morning and got to sleep with images of flowers dancing in our heads. Everly (my daughter and my number one assistant for the weekend) and I woke up before dawn. I have learned from flower growers that it is imperative to cut flowers and foliage duringthe coolest, early hours of morning. It results in the freshest, least wilty flowers. I find that the gorgeous sunrises are often a reward for these early morning sessions. Today was no different. In fact, it was a magical sunrise over the fields and fences as we headed to my Aunt’s house. Really, it couldn’t have been any prettier, quite like a painting around every corner. Being up at this hour reminded me of my 5:30 am rides that I used to take with some of the older ladies at the barn who preferred to finish their horseback rides before it got too hot. This time, however, I wasn’t tacking up horses at the crack of dawn, but, instead, I was loading the van with buckets of water for a foraging session with my Aunt Liz, the groom’s mother Kim, and Everly. We drove to my Aunt’s various gardens that she had planted especially for the wedding, and we cut dahlias, dusty miller, asters, zinneas, plumbago, and more. We then moved on to all sort of bushes and trees that I only wish we had in Iowa! I went crazy over the magnolia leaves, boxwood, holly, wild honeysuckle vines, oak leaves, nandina, and so on and so forth. We piled two vans full of goodies and took them back to the basement. Here are the moonflower entryway "posts" to the wedding site that my aunt planted from seed and watered all summer! Next, Everly and I set off for two flower farms about an hour and a half up into the mountains. The drive was so beautiful passing through the wine country and eventually up and over a mountain pass. It did take a while, but it was a nice time to catch up with my daughter and relax a bit. First, we arrived at Pharsalia Farms and met up with the owner Foxie. She had buckets full of goodies for us, as planned, but she also had fun surprises too, like grapes from a vineyard, little apples, and even some figs! I had asked her to give us whatever was in Brodie’s blue, purple, green, and cream color pallet that was seasonal and interesting. She certainly did! We picked up 9 buckets of all sorts of flowers and greenery from Foxie, who was such a knowledgeable, creative, laid-back woman. Meeting flower friends along the way is such a fun part of my business—again, it’s like going to the farmers markets and meeting the growers of your food verses buying it off a shelf at the store. Next we set off for Blue Heron Farms and met up with Nina who had more flower buckets for us brimming with late summer Virginia beauty. We arrived at their adorable red barn sitting at the foot of the mountains and had to pinch ourselves that we were here. We used literally every square inch of the van to get everything inside. The oakleaves that I cut along the roadside may have been taking up a little too much room, but I had big plans for those in the ceremony urns so I stuffed them behind the seat and we were off. We did stop to take a quick selfie just to remind us of this amazing adventure. Once we got home, it was time to unload and organize the flowers. With large events, I like to take time at the beginning to organize which flowers will be used for which items. This helps us know that we will have enough flowers for each creation. Before I knew it, it was time to do a 5 minute change and head down to a “low boil” dinner at the barn, hosted by my Aunt, to kick off the weekend of festivities. A low boil is a super fun, easy for a crowd (there were over 120 people in attendance!) dinner that is common down South. Essentially, you pile potatoes, shrimp, sausage, corn on the cob (and you can of course add other items like crawfish etc.) into a huge pot of boiling water to cook. When it is ready, you strain it andlay it out straight onto the tables. As guests we had a blast just eating right out of the piles of food, cracking shrimp, slathering butter on the corn, and soaking it all up with bread and roasted garlic. YUMMMMM. My Aunt had gone all out and strung the barn with lights and lanterns. She had freshly stained the wood, painted the walls, scrubbed every inch of the place and decorated the tables with magnolia leaves and rope. It was pretty amazing to say the least. I stepped outside at one point and saw the moon rising over the tables and the guys playing corn hole and heard a country song from K.T. Oslin on the stereo; it took me back to being 14 in that same barn. Amazing how a song can do that. It was quite a way to kick start the wedding weekend. I picked my hubby up at the airport and we headed home for a few hours of shuteye. To continue reading, here is Part Two and Part Three! Before moving on to the winter holidays, I wanted to share some pictures from the Thanksgiving garland I made for our table. My mother’s entire family met out in Charlottesville, Virginia this year for Thanksgiving at my Aunt’s house. She lives on a large horse farm nestled at the foot of the picturesque Blue Ridge Mountains. We were all assigned our tasks for the Thanksgiving feast, and mine was to decorate the table. Rather than drive into town to buy some flowers for centerpieces, I decided it would be more fun for us to forage anything we could find from the farm and create a garland. To me, this idea was far more seasonal, local, meaningful and (hopefully) more beautiful! A few of us set off on Thanksgiving morning to take cuttings from whatever we found. Fortunately both my Aunt and the former owner were avid gardeners and had all sorts of gardens around the farm. 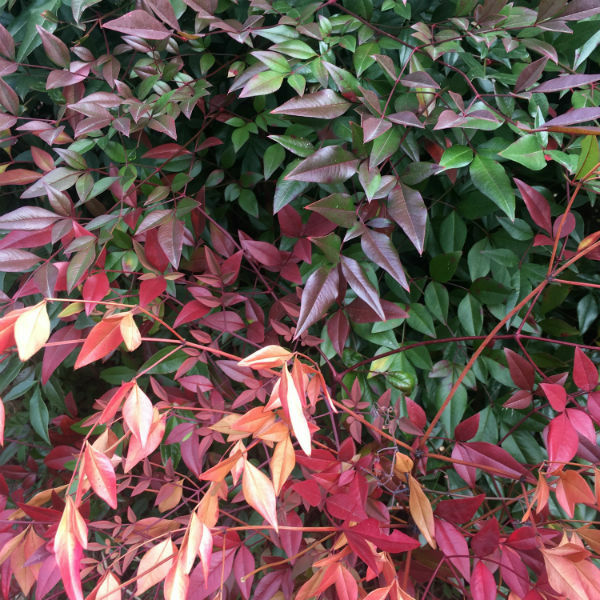 There were some gorgeous nandina bushes with the most amazing colored leaves and lush red clumps of berries. 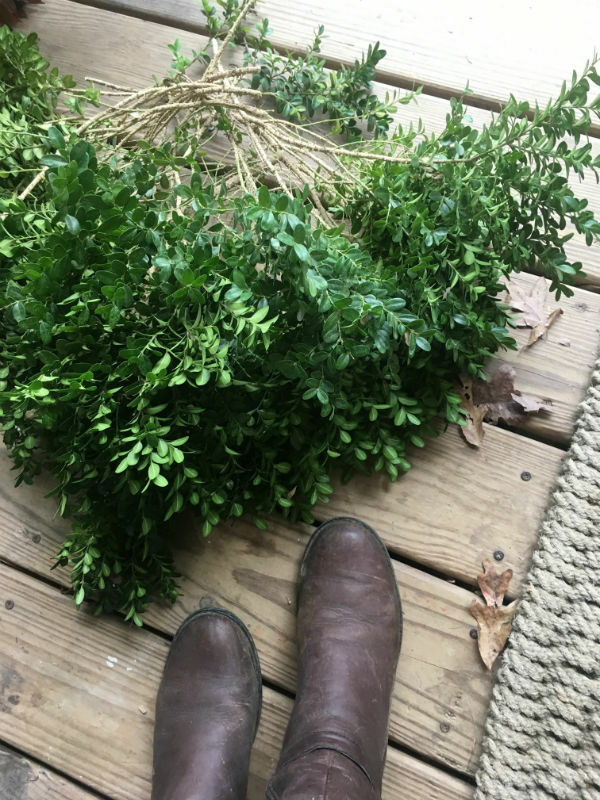 Then, of course, I gathered lots of incredible boxwood (which was so full and gorgeous compared to what I often get when I order it in to the shop). 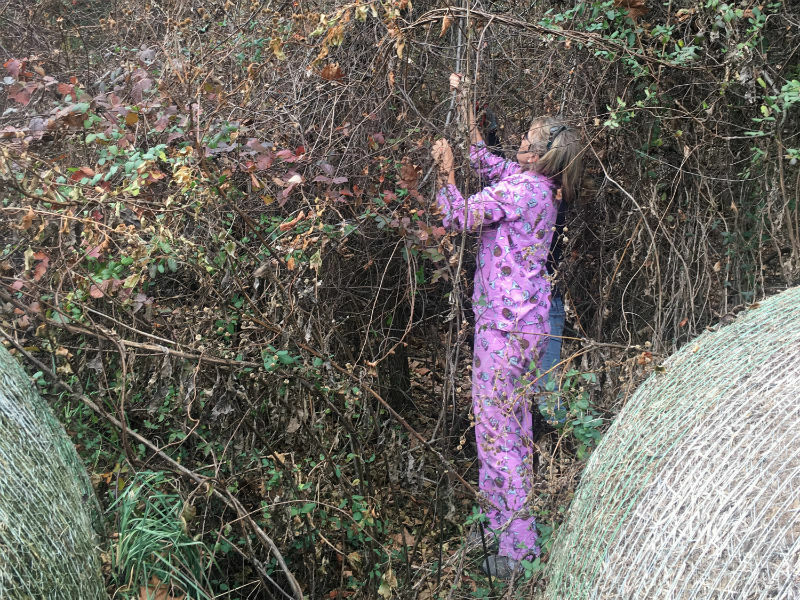 We then headed down to the lower hay field to hunt for bittersweet in the woods. Here is a picture of my Aunt, who you will note is still in her P.J.’s, which cracked me up! The best part was that we hit the jackpot and found 3 different vines to borrow from. 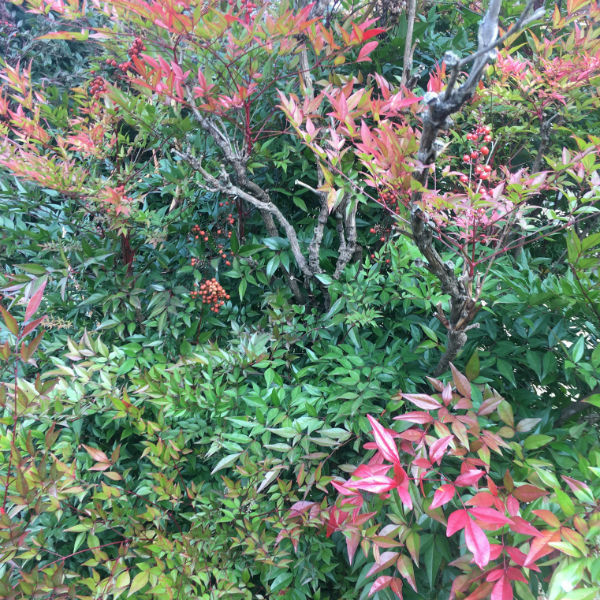 On our adventure we also found some privet berries (dark blue ones), bright red winterberries, camelia foliage, magnolia leaves, and nice fragrant cedar branches. We filled up the minivan and headed home. I set to work grouping little bundles of greenery and berries and wiring them on to a length of twine to create the garland. (If you want to know how to make a garland, stay tuned as we will be offering a holiday garland class soon!). We got out a bunch of my grandmother’s brass candlesticks and tucked them amidst the long garland. It looked lush while still allowing people to easily see over it, so as not to impede conversation at the table. My daughter took the loose, left over magnolia leaves and used them as place tags by simply writing names on them with a sharpie. We also used some leftover sprigs to tuck under the decorative turkey for the kids table. Here are a few pictures of us sitting down to dinner and then of dessert lined up on the table afterwards. It was a lovely, candlelit meal with all of us together enjoying stories and a delicious spread of food that everyone helped to make. It was a particularly special Thanksgiving as my grandparents are in their 90’s and almost all of their descendants traveled from coast to coast to be together. There was so much to be thankful for; our hearts were as full as our stomachs by the end of the night. As I head into the hustle and bustle of the holiday season, I take a few minutes to fondly look back on Thanksgiving and to count all the many blessings in my life. Last month we opened our doors for the January Flower Sale. We brought in a ton of orchids; there were orchids in pots, along with a myriad of loose stems in a wide range of colors and varieties. We also had the oh-so-fragrant hyacinths and flowering white quince branches. It was a dreamy treat amidst the cold, dreary days of January to see all these beauties in the shop! We had dendrobiums, tiger tales, mokaras, cymbidiums, Phalaenopsis, and even the brilliant Vandas. We paired the orchids with unique ferns and blooming quince branches for simple, elegant combinations. Most times you won’t see orchids at florists’ shops because they are too expensive just to put in the cooler and hope they will sell. That is what made our large display so special. If you missed it this year, don’t despair, we will do it again next winter. Something that we still have in the shop after the sale are the Fantasy Orchid DVDs and fertilizer. Fantasy Orchids is an world-class orchid nursery in Boulder, Colorado that comes highly recommended to me for its orchid care products. You have to see it! There is so much fascinating and extremely helpful information that I have never heard before. I am very excited about being able to get my orchids to rebloom this year with the instuctions and the orchid food they suggested. We have little Orchid Lover's Gift Sets with the DVD and the orchid food all packaged and ready at the shop, and we will try to keep it in stock for the next few months. It was so helpful to demystify orchid care for many of our customers. Here are a few pictures we took. One of the highlights was that we had some really beautiful vessels for the orchid plants. No ugly plastic pots here at Honeysuckle Hollow. We always like to send you home with something that will make an artistic statement in your homes. We used vintage vases, awesome palm wood containers, pottery vases, wooden cubes, and terra cotta pots to name a few. And lastly I would like to put out a big thank you to my parents who were in town that weekend and helped me with my kids and with preparations for the flower sale. I love them dearly, and we had such fun together. Here is my Dad helping me forage some fresh evergreens for a corporate party we did while he was in town. We always have the best time out in nature together, and it was a pleasure to spend his birthday together this year. And my Mom, the master gardener who planted the seed for my love of flowers, here she is potting some huge Dutch amaryllis bulbs a few nights before the sale. It really is a family affair at Honeysuckle Hollow. We are a small family business, and it takes everyone to get it done. I love being able to bring my kids to work and show them how to run a business, create beauty, and do what you are passionate about. My son, Cale, spent his day off school driving to Omaha to pick up orchids that were flown here overnight so they didn’t freeze in a truck. He unloaded all 10 boxes with me and melted my heart as he ooh-ed and aah-ed over each different one. He will make some woman very happy one day with all his flower knowledge and appreciation, I hope! And my daughter, Everly, is at almost every sale running the check out, baking the cookies, and doing anything we need. Unfortunately this sale was on Friday so she was studiously attending school, much to her dismay. The next few sales will all be on Saturdays so she will be there! My hubby was out of town over our January sale (hence my parents needing to come to help out), but he is always the biggest support to me from business advice to helping to hold down our household during busy events when I am at the shop late. Even my Mother-In-Law and Father-In-Law play a huge part in me being able to do this business. They grow lots of flowers and let me use them in my designs, and they help care for my children when I am busy. I’ve said it before, but it sometimes takes a village. This blog is dedicated to my family who helps me on this crazy, exciting adventure that keeps me up at night with anticipation and lights my heart with a creative spark. I love you guys.